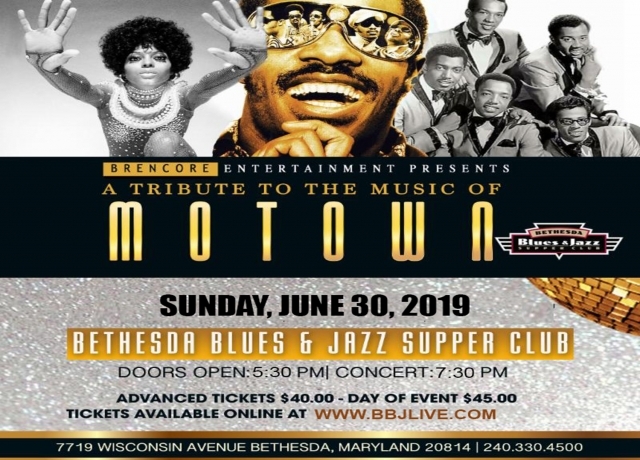 BRENCORE Entertainment Presents “A Tribute to the Music of MOTOWN featuring The BRENCORE ALLSTAR BAND at the Bethesda Blues and Jazz Supper Club. If you love the music of MOTOWN then you will enjoy this production featuring 14 of the most talented vocalist and musicians from the Washington, DC area. Let us take you on a journey through the Music of MOTOWN performing the hits as we Tribute to Smokey Robinson, The Temptations, The Four Tops, Diana Ross, The Supremes, Gladys Knight and The Pips, Marvin Gaye, Tami Terrell, Rick James, Michael Jackson and more. This tribute will have you dancing in the streets. Hurry and make your reservations for BRENCORE Entertainment's Tribute To The Music of MOTOWN.